For the second year running, Loungerati operatives took over the Ricard tent at the Bastille Day festivities along Brooklyn's Smith Street. The scene of the crime was on Dean Street. The object of liberation - a table for the crew. Seat by seat we skillfully took a table and brought in beers from the corner stores and Ricard from Bar Tabac. Among the cognoscenti were The Cad publisher Jack Newcastle and his crew from Kingston 66 and the Fedora Lounge. This year Lillet and St.Germain (elderflower liquor)joined Ricard in sponsorship of America's largest petanque tournament. Naturally, we had to sample a few cocktails for quality control and research purposes. Michael Arenella's Dreamland Orchestra provided hot 1920's jazz while jitterbugs danced in the street in a scene reminiscent of a lost generation Bastille Day party. Thanks again to Bar Tabac, Robin de Bois restaurant, Ricard, Lillet, Saint Germain Liquer, and The Dreamland Orchestra for making the 7th Annual Brooklyn Bastille Day a success! Stay tune for next year's event!!! I am a firm believer that one cannot accurately review a new establishment based upon one visit during the first week, let alone opening night. Bars, like restaurants, need time to settle in, to work out the kinks. The initial days and weeks involve growing pains, a learning curve, and sometimes personnel changes. Cocktailienne Julie Reiner's new Clover Club at 210 Smith Street in Brooklyn’s Boerum Hill neighborhood,is no exception. Since it's late June opening, I have visited "Clover" often twice a week and have witnessed its' maturity. Further, this gin mill is getting better with every visit. The Clover Club is a 78-seat lounge and private (as in no standing) back parlor which can hold 30 patrons. 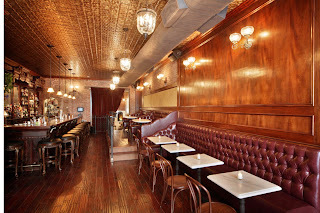 The decor is Victorian influenced but feels like Brooklyn, with rich dark wood interior, mosaic tiles, maroon leather banquettes, and elegant antique lighting. The bar, where the Loungerati set spend most of our time, is 19th century restored mahogany wood bar, which according to Julie Reiner "was hand-salvaged from a house in an old coal mining town in Sugar Notch, Pennsylvania." To really gauge whether a cocktail lounge of this caliber is the real McCoy, I start off by ordering OFF the menu. Any mixologist worth their sleeve garters should be able to make the following cocktails: The French 75 (Gin or Cognac), Classic Gin martini, a Daiquiri, a Sazarac, a Manhattan, a Gin Fizz, and the Old Fashioned. Rumor has it that the bartenders at several new high end cocktail joints were only proficient with the cocktail menu but lacked the over all chops to produce the classics. Well let me be the first say this is not the case at Clover Club. Like skilled chefs, the bartending staff not only produced any classic I ordered (including personal favorites like the Gin Daisy and Plymouth Sloe Gin Fizz) they executed the drinks brilliantly and even added their own signature. Once convinced of the classics, I was ready to sample the menu. The cocktail pedigree behind the bar is impressive as the menu. The Lonsdale in London. Pegu Club and Flatiron Lounge in New York. These are some of the names on the resumes of the talented team of bartenders. Flatiron alum Giuseppe Gonzalez assumes the role of head of the class. Despite being an award winning mixologist (last year he won the 2007 Vinos De Jerez Cocktail Competition), Giuseppe prefers to be called a bartender. See the profession runs in the family and he is his father's son. Gonzalez helped design the menu (have I mentioned Jersey Julep?) and delivers his hand crafted cocktails with a smile and without pretension. He represents the vision of the club which is refinement and style without being contrived. Clover Club also features a selection of small plates. A few highlights include Oysters on the half shell (which were so plump and fresh that they probably didn't even need that delicious cucumber mignonette sauce but I'm glad they included it! ), a mini-lamb burger which is perfectly cooked and accompanied by homemade waffle chips, and the Steak tartar (described by Jenny from Carrol Gardens as "Lick your plate good".) And I almost forgot, the Deviled Eggs four ways. Gulp. Nothing make a gin martini go down smooth than "the eggs"! Nine times out of ten, I occupy the far corner of the L-shaped bar which I call the dug out. I sit next to the lighting/heating panel and move when the managers come to tweak the ambiances. The antique scones and bar lights are adjusted as the sun sets. As Julie told me, "Unlike Flatiron, which is more like a cave, Clover Club has lots of natural light." So as the twilight approaches, the mood of the bar adapts. By nightfall and especially in the back room (yes I was able to secure some seats), you feel that your are in a swank refined club. The crowd showing up is as diverse as Brooklyn itself. One night a crew of gals who called themselves the "boriqua nurses" were having a good old time, the next it was couples on dates, then vintage clad mods ordering the classics, journalists, bloggers, Smith Street barflies, fellow mixologists from Milk & Honey & Death & Co, and Esquire's cocktail impresario David Wondrich. The next time around a family of Hasidics took over a nearby banquette, which was later occupied by a birthday party of twenty something professionals, and then more revellers from Queens, Manhattan, Bayridge, Carroll Gardens, Red Hook, Park Slope, Fort Greene, Sunset Park, even bloody Edinburgh, Scotland arrived! Finally, the back parlor room which seats up to 30 guests, is separated from the front of the house by heavy tapestries and a hostess. The room is decorated with velvety Victorian parlor furniture and I'm sure come winter time, it gets real cozy by the elegant marble fireplace. The objective of the parlor is to allow loungers to enjoy a more intimate experience - a speakeasy in the back room of a lounge...now that is a curtain I can get behind! The Clover Club is located at 210 Smith Street, between Baltic and Butler Streets, and is open Monday-Thursday, 5pm – 2am; Friday, 5pm – 4am; Saturday, 2:30pm – 4am, and Sunday, 2:30pm – 12:30am. 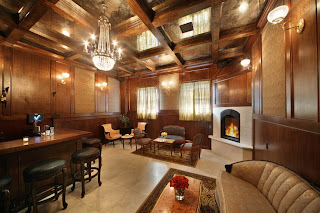 Reservations are accepted in the parlor room only by calling 718-855-7939. Crown Heights is Brooklyn. It is a multi racial neighborhood which is in the midst of economic and cultutral transition. When tensions flare they make national news but the neighborhood feel of the place is unmistakable. The turn of the century brownstones, the stretches of Eastern Parkway reminiscent of Parisian boulevards, the Hasidic temples, the East Indian churches, and the eastwardly expanding "gentrification" make for a vibrant mosiac. Clearly there must be a place to get a drink in a ward this diverse! So on the Fourth of July, we decided to investigate the new beer garden called Franklin Park on the border of Crown Heights. The stop was part of a marathon day which began at Egg in Williamsburg for biscuits and gravy and Eggs Rothko, then a pop in at the Murakami exhibit at the Brooklyn Museum, and a few more BBQs before trying to make it to New Galapagos Art Space opening in DUMBO. After spending an hour viewing the "Andy Warhol" of Japan's 3-D Anime,pop murals, and forcibly removing a Murakami designed Louis Vuitton bag from the clutches of the female members of our party, we needed a break. Preferably one that included booze and open air. Well I had heard about a new beer garden off Franklin Avenue and remembered that we were in the vicinity. So we hotfooted the three blocks down from the museum. On the way we passed a Reggae DJ blasting his beats for the entire block, signs warning against "loitering and dealing", the S Train snaking along forgotten tracks, and a sign that offered LOVE at 797-9100. Franklin Park is more like a refurbished garage with a long drive way that has been converted into an outdoor drinking area filled with long picnic tables. Also unlike the German style gardens in Astoria and Williamsburg, this haus is not trying to transport you to Prague or Munich, it is strictly Brooklyn. Beyond the "garden" area is a cozy little bar whose base is covered in black and white tile and complimented with a wall length wrap around banquette and a half dozen cocktail tables. Above the banquettes were scrapbook like murals as well as a black and white scene of a vintage soccer game. More important than the decor, the bar is stocked with an excellent selection of whiskey, bourbon, rye, and even gin! "Welcome guys, it's Happy Hour!" The bartender named Sean greeted us with the good news and I checked my watch. It was barely 2pm, but I wasn't complaining. The lads ordered a few of the 12 micro brews on tap which included several local beers, while the gals opted for the Rum Rickey which Sean was making from scratch. I liked that. The owner was there too, he is also a partner of the live music venue Southpaw in Park Slope but this was a completely different scene. FP is the kind of place you can relax outside reading the paper on a Sunday afternoon or get "loose" at the bar on a Wednesday night. But Sean keeps it under control but in a mellow way (or so he says). We always stay for three drinks and by the time I was "sampling" Bulldog Gin, it was time for us to hit the next spot - a BBQ on Atlantic & Hoyt where rumor had it there would be scallops wrapped in prosciutto. As we left, the joint was beginning to fill up with an eclectic crowd. Luckily the summer is very long and a visit to Crown Heights's lounging jewel is now on the agenda. 618 St. Johns Place btwn Franklin Ave. & Classon Ave.